It used to be easy to develop tag-based data capture systems for customer click data and aggregate it for analysis by marketing. But not anymore. Websites are more complex – and as massive volumes of data come in from multiple online channels, IT needs to roll it up, match it, consolidate it, and manage it. 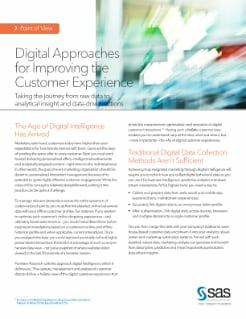 This paper overviews these challenges and explains how SAS Adaptive Customer Experience solutions use real-time, dynamic data collection technology that improves upon traditional Web analytics tagging, enabling rapid transformation of the data into customer-focused insight. Companies can create a complete customer profile based on data from both online and offline channels and use it to execute more relevant, targeted, personalized communications.